We’re pretty sure that we can all agree that the most important thing we learned from the Arabian Nights is that, when it comes to Genies, it’s actually not okay to use one of our wishes for more wishes. Which most of us have spent our whole entire lives thinking that that would the first thing we would wish for, so it was very dismantling to our whole entire Genie-related worldview. It’s like having a carefully thought out and practiced answer to “What 3 things would you bring to a deserted island?”, and then being told that you actually aren’t allowed to bring your favorite fast food restaurant fully stocked with those fries you love. Which throws your other two desert island provisions - a solar-powered laptop and an industrial fryer - totally askew! After all, what kind of nerd says, “Whoa, maybe I should just keep my wishes reined into just the number granted and not try and trick this ancient magical being by thinking outside the box”? Anyway. The point is, that book has been out forever now and we still don’t know what exact 3 things we’d wish for. 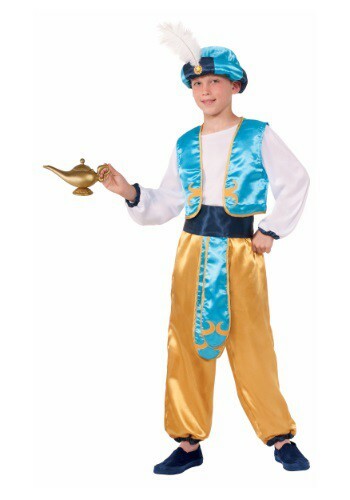 So, do your child a favor and prepare them early for this kind of existential quandary by getting them this Child Arabian Prince Costume! Even if he doesn’t manage to find the magic lamp and free the genie (tough break, kid! ), he’ll still look and feel like all his costume wishes have been granted!